The School of International Service (SIS) welcomes United States National Security Advisor Susan Rice at 3:00 p.m., Wednesday, October 26, as she delivers an address about protecting and promoting LGBTQ human rights around the world. Following her speech, Ambassador Rice will take questions from Twitter using the hashtag #GlobalEquality. Her speech comes at a time when LGBTQ violence and discrimination in the US and abroad continues to make headlines, and security and protection efforts gain momentum. Last month the United Nations (UN) Human Rights Council appointed its first independent investigator to help protect lesbian, gay, bisexual, transgender and intersex people from abuses. As the Obama administration comes to a close, Rice will summarize efforts made to expand and defend the human rights and dignity of LGBTQ people around the world, as well as outline challenges that lie ahead for the next administration. “This issue has long been an important element of the Obama administration's human rights agenda, dating back to its first articulation by then-Secretary of State Hillary Clinton in December 2009,” said Professor Sarah Snyder, referencing a speech delivered by Clinton about key elements the administration would work toward in pursuit of global human rights. “We are honored to have Ambassador Rice visit SIS. Part of our promise to our students is that we will prepare them to build understanding in our world. Hosting national and global leaders here, particularly to speak directly about human rights for LGBTQ citizens, helps fulfill that promise. I’m eager to hear what she has to say,” said Dean Goldgeier. Susan Rice currently serves as the 24th US National Security Advisor. 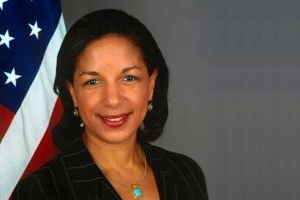 Prior to this role, Rice was a US ambassador to the UN, US diplomat, assistant secretary of state for African Affairs, and Brookings Institute Fellow, as well as on staff at the National Security Council. To attend the event, co-sponsored by American University’s School of International Service, Human Rights Campaign, and Human Rights First, please RSVP. Rice’s speech will also be livestreamed here.